America Right?! This piece grew out of my own frustrations with money, my negative thoughts about it, and wanting a better experience with it. Upon its completion I realized this piece was about perspective, not just my own, but the various ones people expressed as I publicly showed it on Wall Street in front of the New York Stock Exchange. For some it was clearly a criticism of the excess of America, another saw it in the context of Wall Street, which he called “the heart of thievery.” But it is all too easy to be a critic and negative when times are tough – as I had been. I realized over the months it took to develop and execute the piece, that the conscious choice I was making at the time to be more positive and optimistic about my financial future allowed me to see it differently, to see that those on Wall St. don’t need more critics, but encouragement to remain aware of the great responsibility resting on them as we move ahead. And as they move money, they move an economy, which moves a nation. Not just any nation or money, but one that moves the world’s economy. 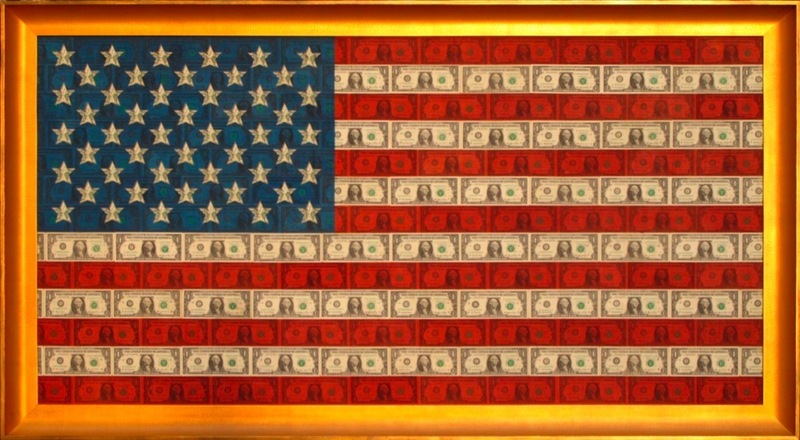 In this piece I try to reunify the pride one nation feels under its flag with the confidence of its economy and currency, and to celebrate the nation George Washington pioneered and the economic power Wall St. built.